Rec. : January 2001 Kammermusiksaal, Friedenau. Jacques Duphly lived through the halcyon days of the 18th century in France, and died the day after the storming of the Bastille in July 1789. A composer of little music - only 52 works of his are extant - he spent most of his life earning his living as a performer and teacher of the harpsichord, but without any official patronage. His music is very much that of his time. It is neither surprising, nor remarkable, but it does have the charm that many of the period�s harpsichord music has - light, airy, expressive pieces, that recall the past and owe allegiance to the music of François Couperin and Jean-Philippe Rameau. This music is at times virtuosic - as in La de Belombre, and Mitzi Meyerson performs with grace and style. The more lyrical pieces, such as the Allemande, are moving and subtle. The selection of works on this disc, and their order of presentation, are quite good, and show an excellent overview of Duphly�s work. Some of the pieces are very "busy"; full of ornamentation, with a rich, lush sound. Unfortunately, the recording has a bit too much reverb, and these pieces, such as the opening Chaconne, sound too confused. (MDG claims that they do not add any artificial reverb or other treatment to their recordings; this means that the room used and miking give this sound.) This is a shame, because the harpsichord Meyerson is playing (a Taskin copy by Keith Hill) would probably sound excellent in better conditions, and, indeed, in the less ornamented pieces, does sound fine, though a bit distant. In fact, this instrument takes on its own in the Menuets, where the sound is more acceptable. 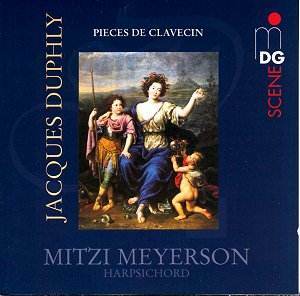 This beautiful 18th century French harpsichord music is admirably performed by Mitzi Meyerson, and, if it weren�t for the over-reverberation on the recording, would undoubtedly be one of the best discs of Duphly�s work. Alas, the sound of this recording is disappointing, and detracts a bit too much from the music.